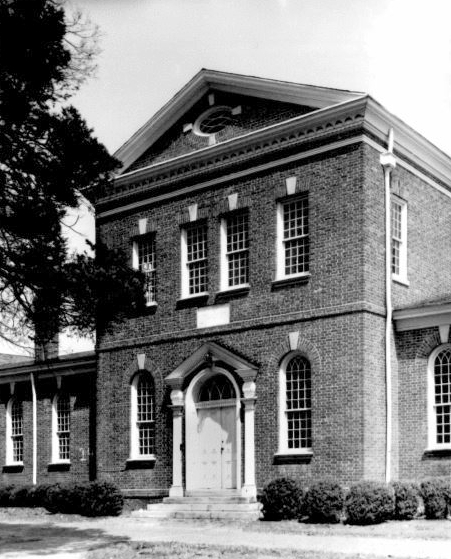 The erection of the next building [at Wake Forest College], Lea Laboratory, made possible a long cherished purpose of the Board of Trustees and other far-seeing friends of the College and provided for the adequate teaching of chemistry. A renewed interest in the matter was shown by the Trustees at their meeting in June, 1884, and a committee appointed to secure funds. This committee had nothing to report in the way of accomplishment at the meeting in June, 1885, but President Charles E. Taylor, in the first year of his presidency, brought the matter again before the Trustees, and in response to his request the Board appointed another committee, which consisted of President Taylor and Professors L. R. Mills and W. B. Royall. The building is on the National Register of Historic Places. This committee was more successful. The college found just the friend needed in Mr. Sidney S. Lea of Caswell County. It was Mr. Lea who with a subscription of $5,000 gave the starting impulse to Professor Taylor's successful campaign to bring the endowment to $100,000. He now agreed to give $8,000 towards the erection of a laboratory for chemistry. It was at first provided that Mr. Lea should receive interest at eight per cent on this amount during his lifetime and that of his wife, but later Mr. Lea indicated that he would not call for the interest unless he needed it, and it does not appear that he ever called for it. In January, 1887, the Trustees further provided that the building should be called the "Lea Laboratory," and that in the front pediment should be set a marble slab inscribed: "In Memory of Sidney S. & Fannie E. Lea." Sidney S. Lea was born in Caswell County in 1810. He died on March 1, 1892, in the 82nd year of his age. He was a trustee of Wake Forest College from June, 1881, until his death. Source: History of Wake Forest College, Volume III 1905-1943, George Washington Paschal (1943). Wake Forest College Campus 1941. The Lea Chemistry Laboratory is building #15 in the upper right quadrant. Click on the photograph for a larger image. 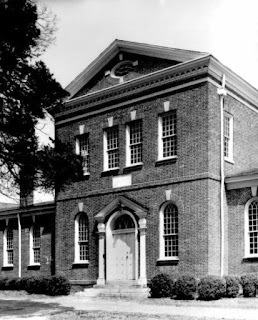 "Sidney Lea's 'Mansion House' still stands on the opposite side of the road from the Blanch, N. C. Prison Camp and it is within one-half mile of the old Beulah Baptist Church site. There Lea buried his wife and erected a beautiful marble stone at her grave. It is assumed that he was later buried beside her. His grave was never marked and presently briars, trees, bushes, engulf the entire cemetery. Sidney Lea was a great benefactor of Wake Forest College. Following the death of his wife he made his will and left the residue of his estate to Wake Forest College and the Baptist Orphanage. in his latter days he stayed with others. Even though his will was recorded, it was not effectual."